The Son-Rise Program UK Essentials (2019, Dates to be announced) is Part 1 and The Son-Rise Program Next Steps (January 18 - 20, 2019) is Part 2. Each of these two programs provides specific and distinct information and attending both Parts 1 and 2 will ensure that you learn everything included in the full five-day Son-Rise Program Start-Up offered on our Massachusetts campus. Part 2 will train you to become more effective and solid by helping you understand how to build more interaction with your child, how to use The Son-Rise Program Developmental Model to strengthen your child’s social curriculum as well as training you to be more creative in the playroom. Click here for more information on The Son-Rise Program Next Steps. Techniques to build your child’s Eye Contact, Attention Span, and Flexibility. SCHOLARSHIP ASSISTANCE: Available to all who apply and meet the criteria. SENIOR TEACHERS / TRAINERS: Dedicated, caring instructors who have helped thousands of families worldwide. "My son Jack would spend most of his time crying, so frustrated that he couldn’t communicate his feelings. I saw changes immediately when I started The Son-Rise Program. He started to say new words, his eye contact improved immensely and he started to share an interest in the world around him. I feel with the expert training I have received, I have grown so much. My whole outlook on life has changed. I am a much stronger person than I have ever been. My one regret is that I didn’t start The Son-Rise Program sooner." 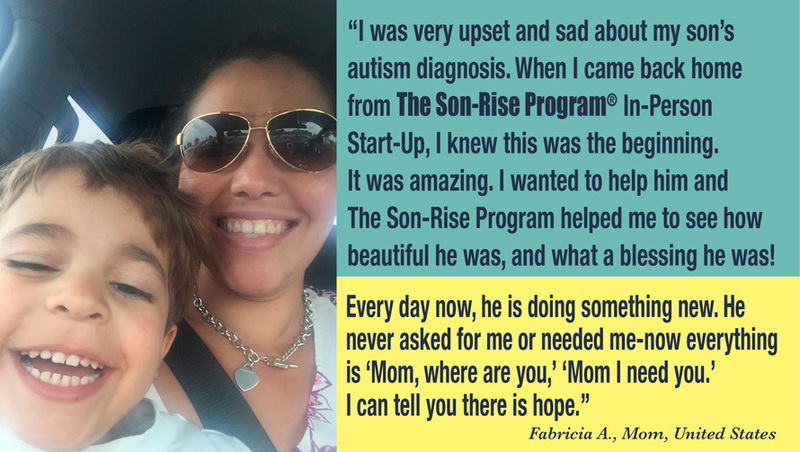 "My son is 23 and we’ve been doing The Son-Rise Program for 9 months. The last 2 weeks have been amazing. He is spontaneously kissing and cuddling me for the first time since he was 4 yrs old. He has picked up pens and is coloring for the first time ever. He is making his own choices without being asked. NEVER GIVE UP NO MATTER HOW OLD YOUR CHILD IS - just believe in them."